The Girard School District Foundation awarded two innovative grants Fall 2013. The grants are designed to encourage faculty to develop and implement projects which will enhance and enrich educational programs and be a direct benefit to our students. Tricia McKenzie was again awarded grant money in the fall of 2013 to purchase a covered water and sand table and smocks for use in the primary playground. Outdoor play is an important way of fostering motor skills. These materials will be used to expand critical thinking and science skills along with increasing fine motor control, hand-eye coordination and sensory experiences. Scott Russell was awarded additional grant money in the fall to fulfill the full-funding of the initial request for 60 exercise balls last spring. 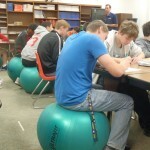 Early results of this project indicate that students welcomed the exercise balls as chairs and were motivated to be engaged in the classroom activities. The goal of this project is to put research to use in order to better serve the needs of students.